Small Race ReportI'm really not one for writing race reports, but I think the occasion of breaking 3 certainly deserves a few words….So as much as I knew it was a sensible idea to run with a similar pace group, after a negative experience a few years ago running with a pacer I thought I would go out and see who I latch onto. 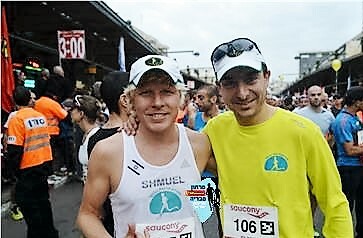 I ended up running with Shai Segev, a fellow runner from Modiin who was also looking to break 3 (and came in 2:59 in the end), knowing that Ram and Jason were hot on my heals. It was comforting to know that they were close by and to echo Akiva's words to see the selfless characters of Yoram, Eti, Yossi etc. on the course. You guys didn't even need to say anything – just the fact that you were our support was comfort enough!Anyways – the first half of the course was pretty straight forward and from previous experience I knew that I just had to keep it together till 30 before the 'fun' really begins, so I instituted a quick/slow strategy alternating kms, not that I was going that slow – I was more like trying to shorten my stride every other kilometer to give me legs a rest, before I got the 30. 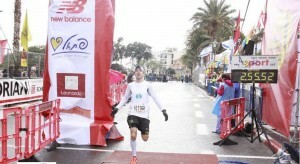 As I turned the corner and Saw Yoram standing there, I was almost as excited as I was at the finish because my watch said 2:03! Yoram let me know I 'only' have 12 ks to go (must have taken a while to work that one out ￼ ) and I knew that I have 57 mins to run 12k and I just needed to keep it together…So I broke it down to 2 km stretches for a bit (amongst other mind games) and saw Jason pass me. Was good to finally see someone on the course!! From 37/38 not much else to report – I saw Jason for the second time and knew he was there as well, which made me happy and then really powered through the last few kms, sprinting the last 200m in @ 3:28 pace…Even though I knew I was under 3, I still could not believe the clock as I turned that final bend! The marathon (my12th) will definitely live with me forever and all those Kms on the road and mental prep in the head finally paid off – oh and a special thanks to someone up there for turning off the water for the marathon To summarize 3 factors which launched me to my PB:1) First and foremost – you guys2) Running on track (this is the first time I have ever trained on track)3) 6 long runs, 5 of which were 34+ including a 39er!